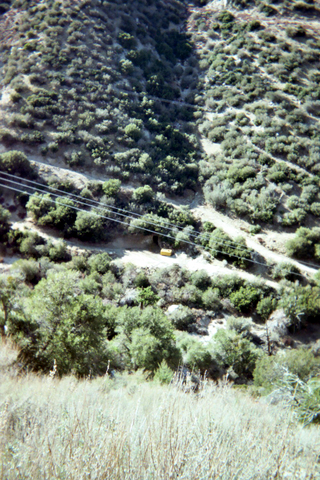 For a nearby gold mine described as "historic" by the forest service, with an entrance clearly visible from the nearby Angeles Forest Highway and its name and location plainly shown on the Pacific Mtn. Topo, the Gold Queen remains remarkably obscure. It is mentioned in print only once in a book long out of print (Heritage Happenings by Meryl Adams p95 (1990)) and nowhere on the internet. 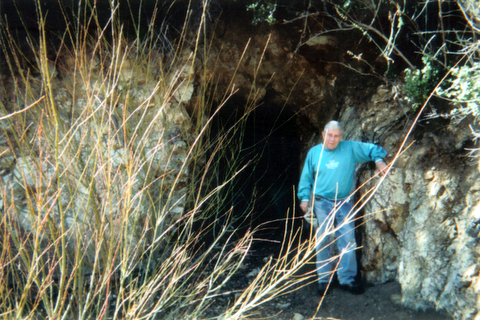 It's located a half mile North of Mill Creek Summit just off the West side of Angeles Forest Highway in a private enclave that was first worked in 1897. How long it was worked and its total length are not yet known by the writer. During its active mining days it was serviced by a wagon road originating at the Acton Railroad Station in Soledad Canyon. This road is now known as the 1893 Monte Cristo Mining District Wagon Road. The now close by Angeles Forest Hwy would not be constructed until 1941. The short stroll to the mine from the Mill Creek picnic area involves walking over part of the original wagon roadway. 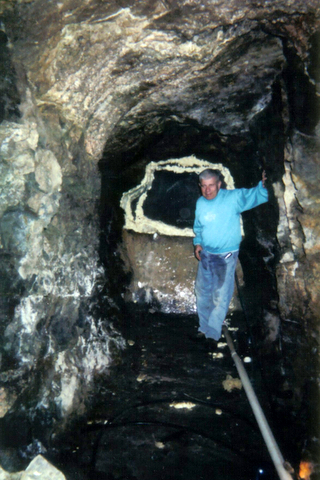 About 8 years ago a new owner, Mr. Ray L. Bothum from Idaho, purchased the private property with the idea of constructing a dude ranch and reopened the old mine including installing two bulkheads. However the dude ranch named the Wagon Wheel Ranch was never completed and remains largely deserted. The mine entrance is just beyond a small empty yellow water tank. Although the mine and adjoining property is not posted the Forest Service does not recommend going onto the property without an invitation. I have not been able to contact the owner. The mine goes straight in for 145 feet. At that point the passage is blocked by a bulkhead. It consists of a 3 foot high concrete dam under which a water pipe protrudes. the remaining passage area is covered by a thin screen mesh held in place by expanding foam. about 10 feet beyond this bulkhead another bulkhead can be seen. Just beyond the first bulkhead the water rises to the top of the dam. The purpose for the bulkheads probably involves a desire to have a water source for the dude ranch. the screen mesh would prevent flies from breeding further back in the mine. Also the bulkheads keep the mine floor reasonably dry which would have been desirable for any dude ranch customers. Prior to the installation of the bulkheads there was probably a foot of water covering the floor. About 200 feet above the entrance and 300 feet toward Mill Creek Summit the is a small exploratory dig 30 feet long. My thanks to website reader Kevin Copley who informed me about the mine, to Daniel Veelik and Eric and Mike Bull who accompanied me on the trips and Forest Service Archaeologists Mike McIntyre and Doug Milburn who provided information on the history of this area.